Hello there…. and welcome to 2015! I’ll start with the last two items I created in 2014…. 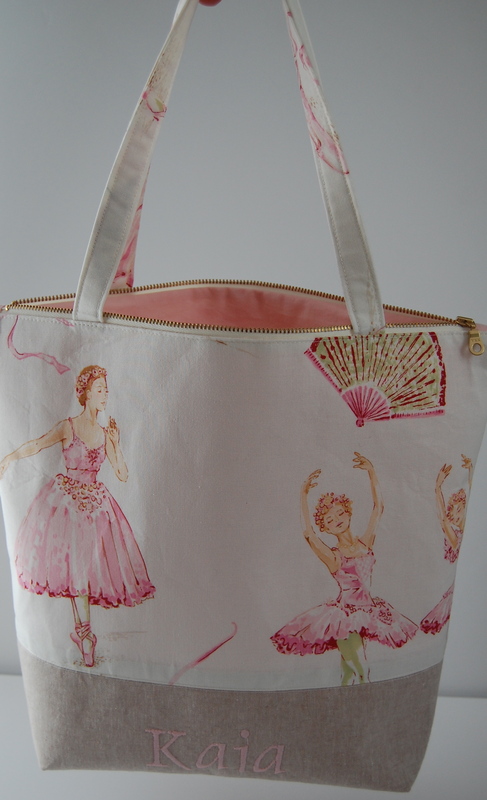 I was so happy to have finally fulfilled my girls’ wish for new “mama made” bags for their ballet accoutrements, (of which there are many). I pledged to have them completed for them for Christmas this year and I’m glad to report that while I didn’t exactly make that goal, I did manage to complete them before the New Year! 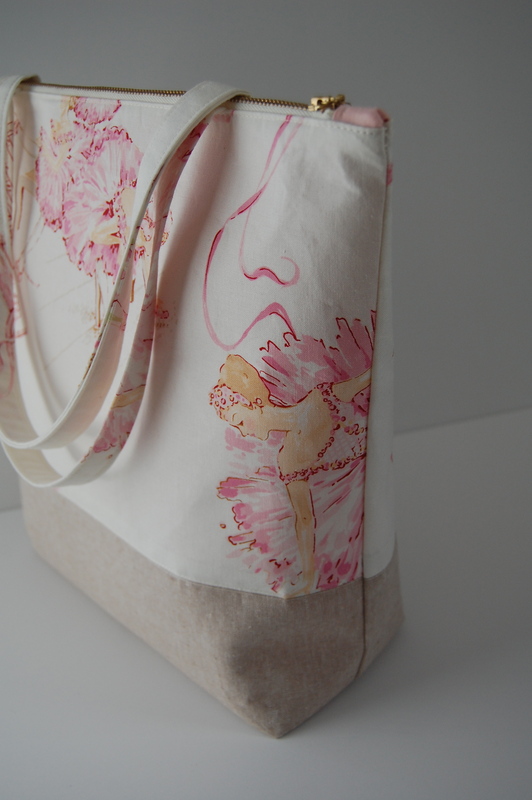 It became quite a process, creating an individual bag for two girls whose personalities and tastes you know and love. They had some very specific requests that, luckily, were the same…. 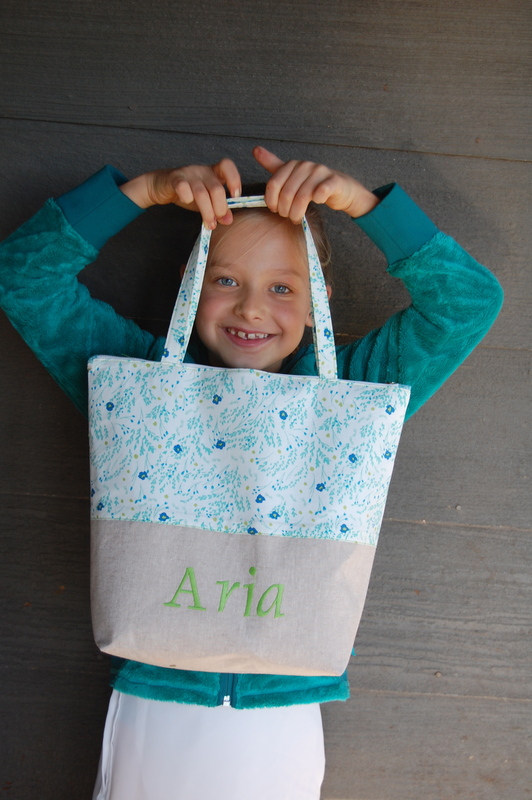 they wanted a zipper, straps, and their name on the bag somewhere! That was where the similarities ended; these girls’ tastes couldn’t be more different!!! And so it began….. 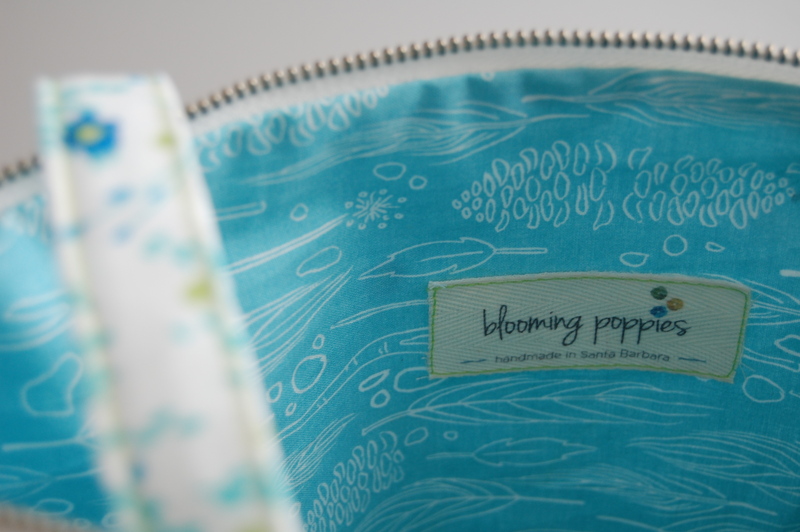 I created this basic design based on my Zippered Project Pouch (which they wanted). 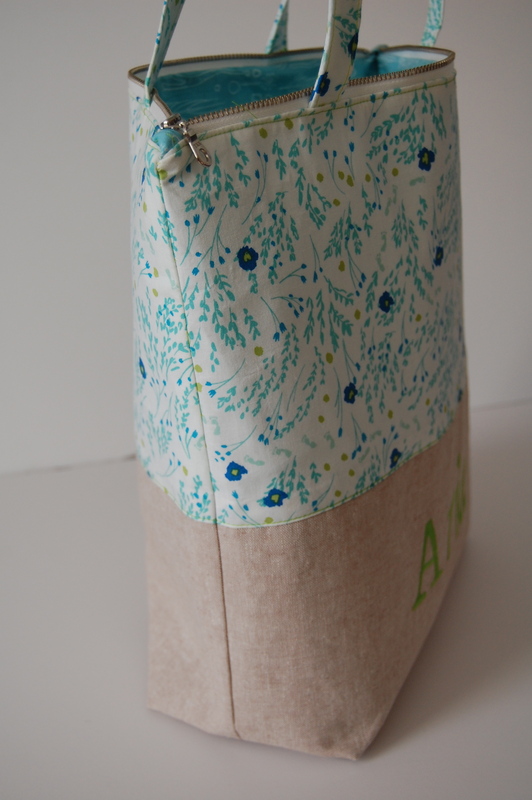 I just added a few inches on all sides to make it nice and roomy, and sturdy yet delicate fabric straps. Then the girls each chose the fabric they wanted. 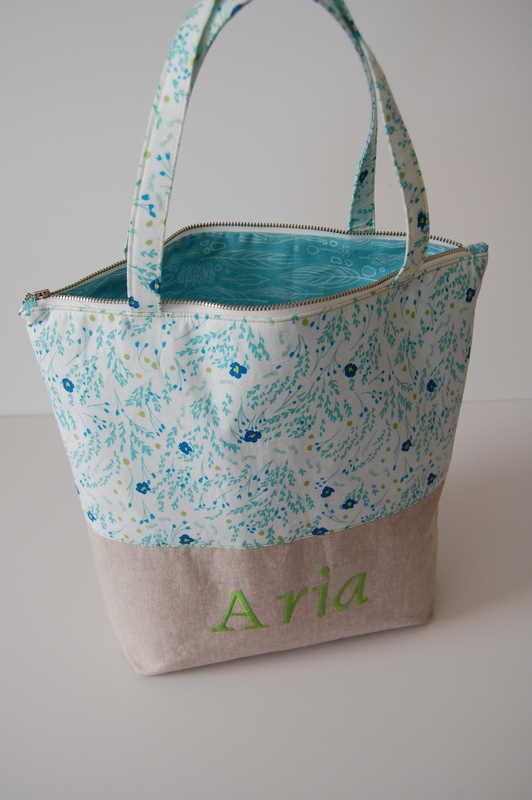 Getting friendly with my embroidery unit again was fun. The girls loved watching their name be magically “written” by the needle and thread. My placement on this first one was a bit lower than I would have liked, but that’s how we learn, right? 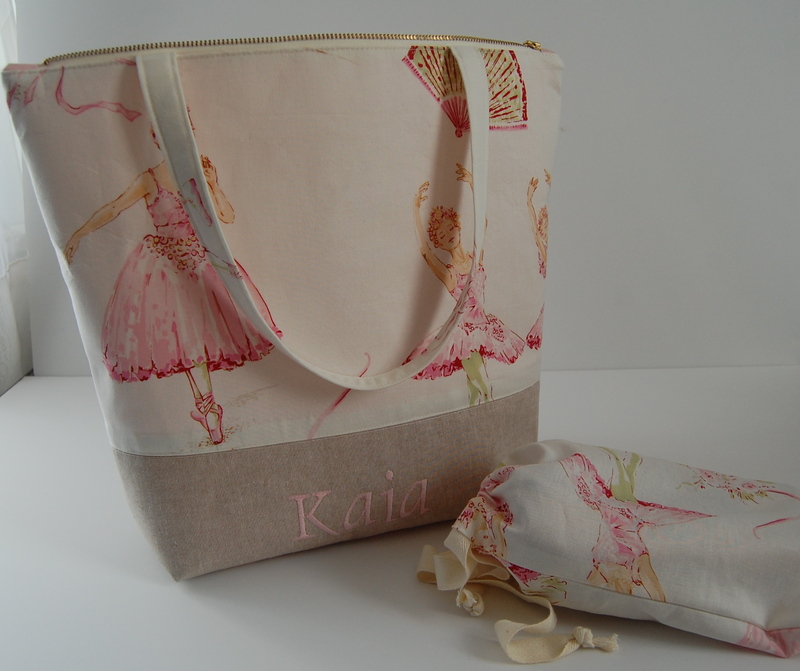 I couldn’t resist sewing up a quick little matching drawstring for her ballet slippers. Then it was on to Miss A’s bag. In our online search (sadly, we have NO fabric stores in Santa Barbara- yes you read that right), we found this really sweet and happy Wee Wander floral print, another winner from Michael Miller, designed by Sarah Jane. This whole line is adorable which made it hard to choose. She finally honed in on two that she really loved. They have all her favorite colors! 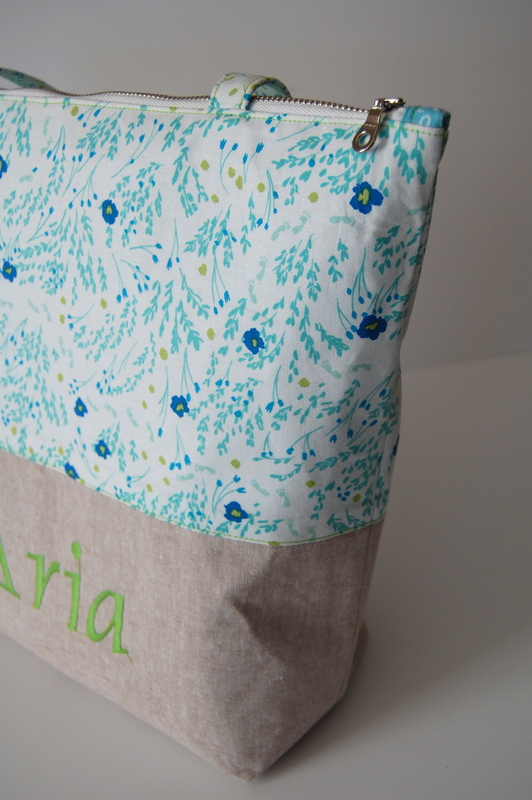 While the bags turned out on the larger size for such little girls, I figure they can grow with them and will be able to accommodate many things over the years. 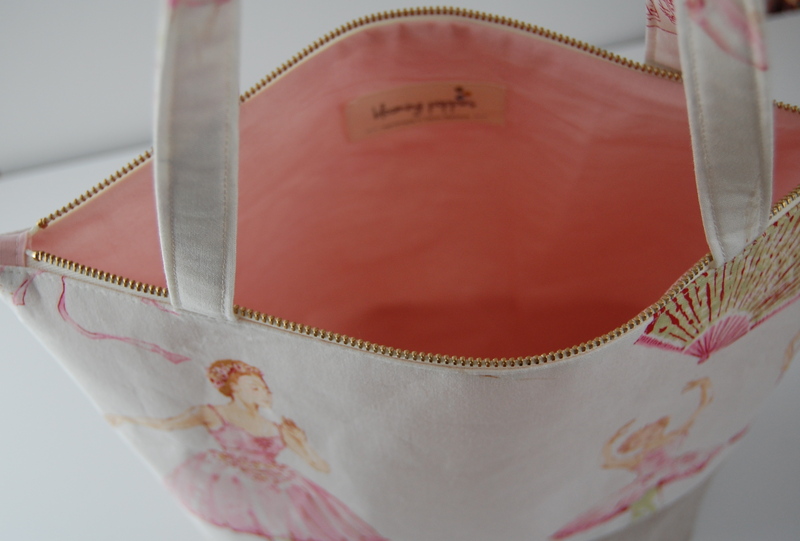 So far, in addition to being used for their intended trips to ballet class, they have been used for toting “stuffy friends”, as overnight bags, and as dolly and dolly accessories carriers, etc. 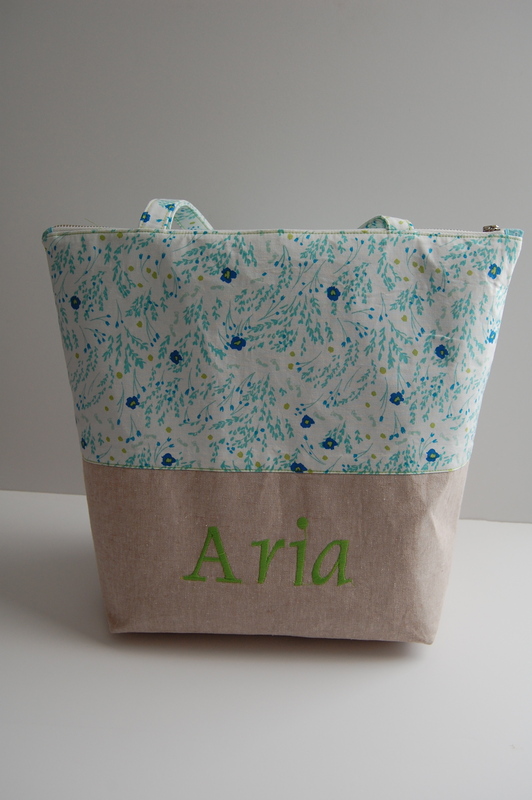 To me, the bags are sweet and adorable, however a bit “grown up” in style. Perhaps because this is what they see me making all the time for my shop, but this is what they asked for….. complete with my blooming poppies label! I was happy to oblige! Creating for my girls is always a path to joy for me. May this new year be filled with much creative and joyful abundance…. 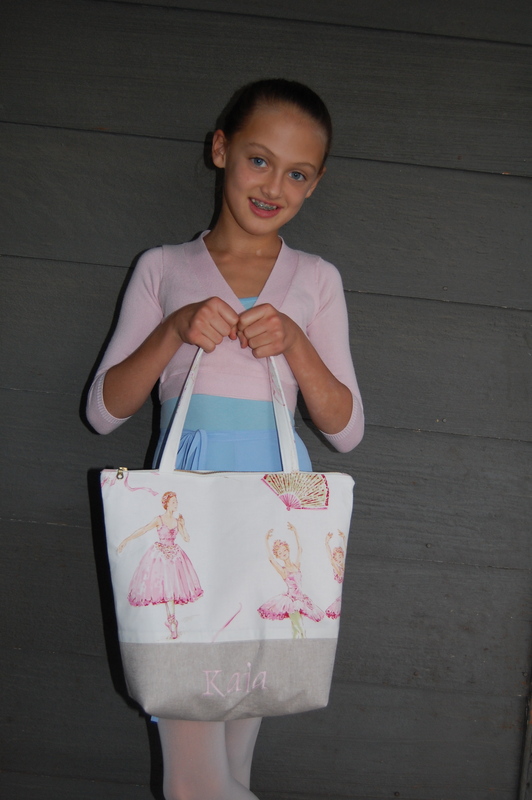 Beautiful bags for beautiful girls made by a beautiful mom. I hope you make more for your shop. All best for the new year! Nice job. These are adorable! Your bags are lovely. Your comment about no quilt shops in SB is so sad. My son is a student at UCSB I have looked for shops on some of mine visits, now I know why I never found one. I still hope to visit Superbuzzy in Ventura before he graduates. Yes, Superbuzzy is our favorite when we get down to Ventura. Sometimes I’ll make a special trip just to go there. There is also Roxanne’s in Carpinteria. But sadly, nothing here in our little SB. These are so beautiful and so perfect for your lovely girls!! Wishing you a happy new year! Both the bags are beautiful, and what gorgeous girls! Thank you for your creative work, for sharing the details in pictures….you are an inspiration for what busy moms can do!